With flamboyant, whorled flowers that attract butterflies and hummingbirds, hibiscus (H. rosa-sinensis) lights up the summer garden like few other flowering shrubs do. These tropical plants come in a wide range of striking colors, including: red, yellow, pink, orange, peach, coral and white. Treat these warm weather shrubs well, and you can enjoy nonstop blooms from spring through fall. Follow these steps to grow healthy hibiscus plants. Select a site in full sun. 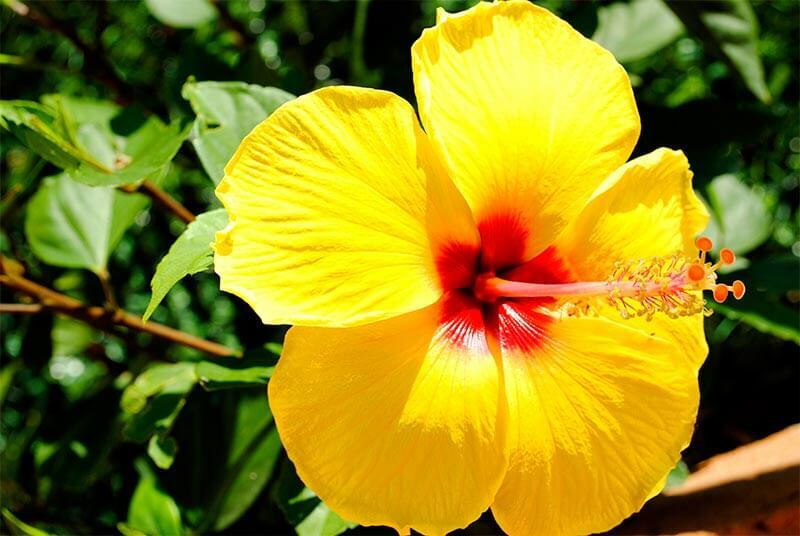 Hibiscus requires six to eight hours of direct sun daily in order to thrive. If you live in an area prone to windy conditions, place plants in protected locations, as flowers are delicate and tear easily. Hibiscus also does very well in containers — a good solution when you wish to enjoy the plants in areas where ground planting isn't possible, such as around swimming pools and on decks. Tropical hibiscus requires temperatures above 45 degrees Fahrenheit. So, container growing indoors in the winter is also an option. For optimal growth, hibiscus requires rich soil. Enrich the soil prior to planting by amending with homemade or bagged compost and Pennington® Earthworm Castings 1.5-0-0. A 2009 study by the American Society for Horticultural Science found that hibiscus grown with worm compost grew bigger and had better blooms. Further increase soil fertility and encourage profuse hibiscus blooms by adding Lilly Miller® Lawn & Garden All Purpose Plant Food 16-16-16 to the planting area, according to package directions. Hibiscus grows best in slightly acidic soil that has a pH between 6.5 and 6.8. Prior to planting, determine your soil's pH by testing it. If necessary, apply amendments to alter pH. Increase pH by using Pennington® Fast Acting Lime, and decrease pH by applying soil sulfur. Wait two weeks and retest the planting area to ensure that the pH levels are ideal for growing hibiscus. For container-grown hibiscus, use potting soil that drains well and that's designed for acidic plants. Dig a hole in the amended planting site that is as deep as the hibiscus root ball, and two to three times as wide. Carefully remove the hibiscus from its nursery container and put the bush in the planting hole. Backfill the planting hole halfway with the soil dug from the hole, and then water well to settle the plant and eliminate any air pockets. Finish filling the hole and pat down the soil around the plant. Add a one-inch layer of Pennington® Earthworm Castings 1.5-0-0 around the base of the plant, and then water again until the soil and earthworm castings are well moistened. If you are planting more than one hibiscus, space them 3 to 6 feet apart. Keep the soil surrounding the hibiscus moist but not soggy. For the first week after planting, water daily, tapering off to once every two days in the second week, and then about twice a week thereafter, when there is no rainfall. If the weather becomes especially hot and dry, water every other day. Avoid watering the foliage when irrigating hibiscus, as wet foliage can lead to foliar disease, such as mildew. Once hibiscus becomes established and new growth is seen, feed every two weeks with a fertilizer for blooming plants, such as Alaska® Morbloom Fertilizer 0-10-10, which is designed to promote blooming and vigorous root growth. To ensure that hibiscus receives essential nutrients, also fertilize monthly with Alaska® Pure Kelp Plant Food 0.13-0-0.60. To maintain dark-green foliage, apply Pennington® Epsom Salt monthly, as directed. Hibiscus blooms only last a day before closing and eventually falling off the plant. Keep the plant tidy by removing the spent blooms. For plants that you overwinter indoors or grow outdoors in a mild climate, prune the shrub back by one-third in late winter or early spring. Remove crossing and dead branches, and trim back the plant so that all of the stems are the same length. Hibiscus is susceptible to several pests and diseases. 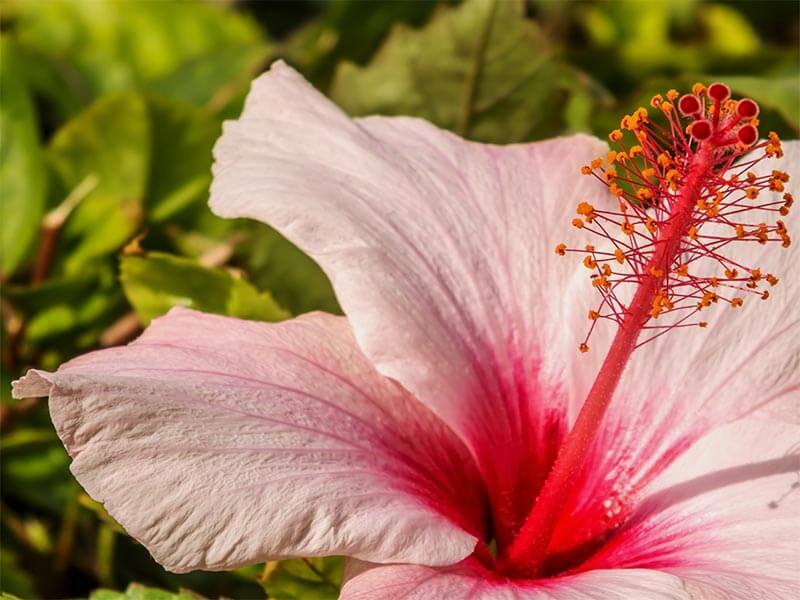 Insect pest damage to hibiscus includes premature dropping of flowers, failure to bloom and thrive overall, holes in leaves and petals, and a sticky substance on plants and nearby surfaces. Common pests include aphids, spider mites, thrips and whiteflies. Check the hibiscus plant periodically for signs of pests and pest damage. Treat minor infestations by removing the pests with a strong spray of water. For recurring or more severe infestations, apply Worry Free® Brand Insecticide and Miticide Ready To Use Dust. This botanically-based pest killer is composed of pyrethrins, which are derived from chrysanthemum flowers. Hibiscus is also susceptible to the leaf diseases, including gray mold (botrytis) and downy and powdery mildew. Such disorders cause white, gray or yellow splotches on leaves, and can lead to moldy buds that fall off before blooming. If symptoms appear, treat the plant with an appropriate fungicide. Growing vibrant hibiscus that lights up your garden with blooms is a rewarding experience. Apply these planting and maintenance tips, and you can enjoy abundant, colorful blooms and healthy, vigorous hibiscus plants all summer long. 3-6 hours, depending on the number of plants. Lilly Miller, Worry Free and Alaska are registered trademarks of Central Garden & Pet Company. Pennington is a registered trademark of Pennington Seed, Inc.